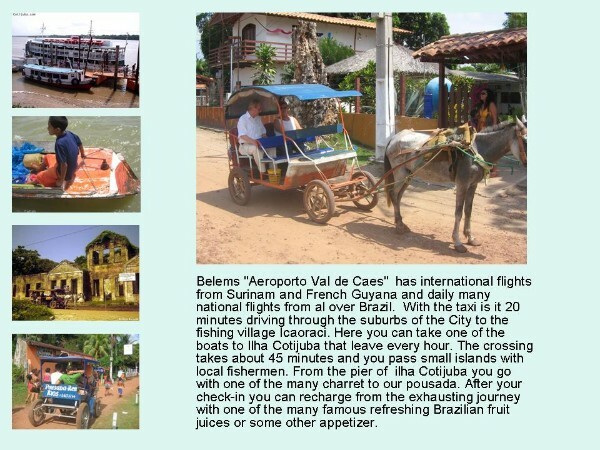 FROM THE LOCAL MARKET VERO PESO IN BELEM GOES DIRECTLY A BOAT TO COTIJUBA ISLAND. A beautifull boattrip 1h30min. for just RS 8.00 passing the local islands. ICAORACI famous for its ceramic art. FROM ICAORACI GOED DIRECTLY A BOAT TO COTIJUBA EVERY HOUR FROM 07:00 TILL 18:30 COSTS 5 REAIS 45 MINUTES BOATTRIP..